Nearly every artist I meet acknowledges a need for inspiration to guide creativity. The application of every stroke of charcoal or paint must be guided by a picture in the mind of the artist of what he is aiming to create. Sometimes the creation of the work of art involves a carefully thought out, obviously reasoned approach and sometimes it is or more intuitive and spontaneous. However, as long as the process is the realization of an idea and not just a random process without any thought of what the result will be (as with a chimpanzee throwing paint at a canvas) then the artists is employing his intellect and is making decisions about the form he creates. Artists need inspiration in both the formation of the original ideas; and in the decisions about how it will be best achieved. I have read a number of books claiming to have the secret to creativity and the inspiration of the imagination, a number of them best sellers. Steeped in high emotion and cod psychotherapy, I found them all unconvincing. I have met quite a few people who read them and thought they were wonderful. While it was clear that reading the book made them feel good, none seem to be able to point to visible results in their art (that I could discern at any rate). I was looking for something that actually seemed likely to contribute to my producing better art, rather than something that relieved my anxiety. Regular prayer for inspiration is part of this, and I would say that the traditional prayer of the Church is the best. This comes back, once again to active participation in the liturgy in the fullest sense of the word. Participation in the liturgy, especially when it includes the liturgy of the hours (I have written a series of articles about the Liturgy of the Hours, here) is not only an education in beauty it is the greatest training in creativity and the most powerful prayer of inspiration and guidance. I have spent much time with Eastern Christians. My initial contact came through learning to paint icons. One of the things that struck me about them was the way they prayed with visual imagery. It seemed to straightforward: they would stand and turn to look the icon in the face, addressing the person depicted directly. Also, they were inclined to sing their prayers in full voice. I might be with a family, for example, and before the meal, they all stood, faced the icon of Christ that was in the dining room and sang an ancient hymn. My reflections on this are in another article called Praying with Visual Imagery. Upon further reflection, and coming back to this issue of creativity for artists, something that struck me is how unlikely it is that an artist who is not habitually praying with visual imagery is going to be able to produce art that nourishes prayer. If I am habitually making that connection between the prayer and the image, then I will instinctively produce art that nourishes my own prayer. If I am praying well, then that art will be beautiful and will, in turn, nourish the prayers of others. This practice of praying with visual imagery is developing my instincts for what is beautiful. It is also engaging my vision in the prayer, and conforming it to the liturgical practice. This is an act of humility therefore that opens the person as a whole to inspiration and guidance , with a particular focus on that faculty of the visual. It has been said that historically, that all the great art movements began on the altar. Think of the baroque. It began in the 17th century as the sacred art and architecture of the Catholic counter-Reformation, but this set the style for all art, architecture and music, sacred and profane in both Catholic and Protestant countries. Therefore the prayer with visual imagery in the context of the liturgy, is a hugely important factor in developing our instincts as to what is beautiful and is the bedrock for the visual aspects of all culture. 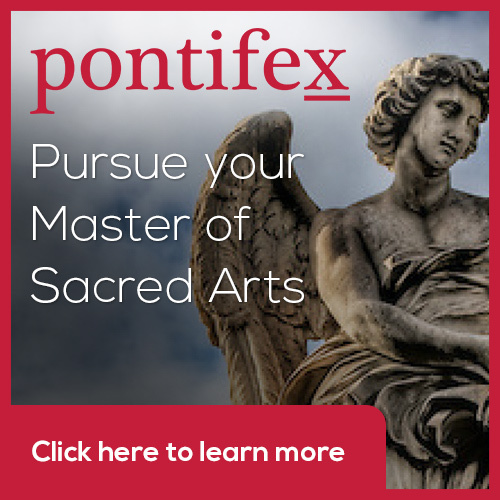 Just as the liturgy, with the Eucharist at its heart, is the source and summit of human life, so liturgical art is the source of inspiration for and the summit to which all other art participates and directs us to. I try to do the same when I am participating in the Mass. Once a month we have the Melkite Liturgy at the college and the priest very obviously turns to face the large icons of Our Lady, or of Christ when addressing them in the liturgy. I do my best to take this lesson into my participation in the Roman Rite. Similarly, at the end of Mass on weekdays we say the Angelus, and we all turn and face the statue of Our Lady which is in our little chapel. The Liturgy of the Hours is a place in which, as a layman, I can do much to adopt these practices. 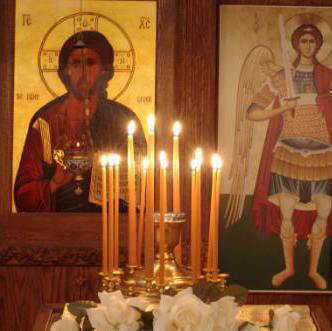 If I pray the Liturgy of the Hours at home, I can use an icon corner to orientate my prayer. When we pray the Liturgy of the Hours at Thomas More College, we finish with invocations special to the community including addressing Our Lady and the Sacred Heart of Jesus. We turn and face these images as we pray. At Vespers and Compline we set up the icon of Our Lady because each has a strong Marian content. At Vespers we say the Magnificat, the song of Our Lady every day and at Compline we always finish with a Marian antiphon. Of course, the use of imagery is just one aspect of engaging the whole person in prayer – appropriate use of incense, chant and posture allows for the active conformity of the whole person to the prayer and so greater openness to inspiration in any human activity. So this prayer of the artists is really a prayer by which any can hope to discover their personal vocation and flourish in it. What does inspiration feel like? We can be transported in ecstacy, as in the painting of St Francis by Caravaggio, below, or St Theresa of Avila, right; but more commonly, the inspiration of the artist is not felt at all. We know it is has been there not because of how we feel during the painting process, but rather by the quality of the work at the end of it. Even if the painting of it felt like hard work, God might have been guiding our decision making processes. And frankly, it's going to be hard to paint if you are fainting into the hands of an angel like St Francis did! And one final point that was made to me in this regard. Inspiration is given by God and He inspires whomsoever He pleases. It is not something demanded or taken by the artist. These methods are ways that develop our ability to cooperate with Him. In the end, if it is not my vocation to be an artist then all prayer and training in the world will not make a great artist of me. However, we can take heart, it will develop everybody's ability to cooperate with the inspiration that He gives to all of us in order to carry out our personal vocations whatever they may be. So we may find that this training leads some of us to something that is, in these cases, even more fulfilling than art. This is one of series of articles about prayer and creativity through the liturgy, the most powerful and effective form of prayer: the others are here. Anyone wishing to learn the traditional methods of art and prayer mentioned in the article can come to the summer programme of the Way of Beauty Atelier at Thomas More College of Liberal Arts. We have traditional art and chant classes that teach the methods in conjunction with the practice of prayer. Alternatively there is a weekend retreat which teaches the principles of the prayer with the art classes. All programmes are open to people of all ages (not just high-school students). The painting at the top is by Vermeer (17th century baroque). Other images described below each one. The Melkite Liturgy at Thomas More College of Liberal Arts, Merrimack, NH. Chaplain, Fr Boucher turns to the icon of Christ at a point when he is addressing Him directly. Pentecost (Jean Restout, French, 1732). An ancient beautiful prayer that leads us to joy, and opens us up to inspiration and creativity; part 1, part 2 here The Divine Office (also called the Liturgy of the Hours), is one of the four pillars of the spiritual life of the new liturgical movement. This is the first in a regular series that highlight the riches of the the liturgy of the Church and how it is at the root of Western culture. 'The Mass is a precious jewel and that jewel has its setting, which is the Divine Office. The Divine Office also has its setting, which is the cosmos.' This is how a priest who was visiting Thomas More College of Liberal Arts put it to me recently. In the picture of words he painted for us, the Divine Office mediates between the Mass and cosmos. Through its pattern of prayer, it highlights for us the rhythms and patterns of sacred time, which are reflected also in the cosmos. The cosmos points us not only to the Divine Office, through its order, but also through its beauty draws us in and lifts our souls to God in heaven. 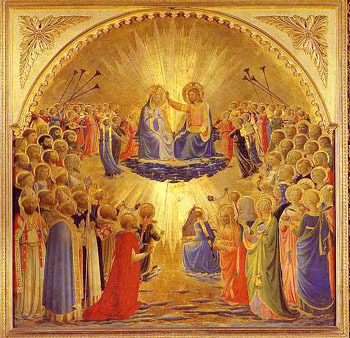 God's angels and His saints are praying the heavenly liturgy - this is the activity, so to speak, of the exchange of love with God in perfect and perpetual bliss. And through the Mass the heavenly and the earthly, the divine and the human meet and the otherwise impassable divide is bridged supernaturally. By it, can step supernaturally into the heavenly dimension. The Divine Office is an often-forgotten ancient form prayer, which has its roots in the pre-Christian worship of the Jews. We can assume that as a devout Jew, Christ will have prayed it, and we know from the Acts of the Apostles that the tradition was continued by His Church. Priests and religious of the Church are obliged to pray it to this day and we would perhaps most commonly associated it with the chanting of monks and nuns. But it is not their preserve. In the past it was a widespread regular practice for most lay people also. The Church of today encourages lay people to pray this too placing it in value above all other prayers and devotions apart from the Mass. I was first encouraged to pray it by my spiritual director, one of the Fathers at the London Oratory, when I was living in England. It has been a life transforming experience for me. In essence the Divine Office is simple. We say, or ideally sing, the psalms at regular intervals during the day, marking significant times called ‘Hours’. It is part of the Liturgy, the formal and public worship of the Church (like the Mass) and for this reason also known as the Liturgy of the Hours. If you want to pray with the priests of the Church then you can see each Office set out each day at www.universalis.com. If we pray in harmony with rhythms and patterns of the cosmos, especially the cycles of the the sun, the moon and the stars, then the whole person, body and soul, is conforming to the order of heaven. The daily repetitions, the weekly, monthly and season cycles of the liturgy allow us to do just that. In his book, the Spirit of the Liturgy, Pope Benedict XVI calls our apprehension of this order, when we see the beauty of Creation a glimpse into 'the mind of the Creator'. This conformity in prayer opens us up so that we are drawing in the breath of the Spirit, so to speak, as God chooses to exhale. It increases our receptivity to inspiration and God’s consoling grace and leads us more deeply into the mystery of the Mass. Also, participation in the Liturgy of the Hours is an education in beauty. It impresses upon our souls the order of the cosmos and so enhances our creativity. Whatever your discipline, ideas that are in harmony with the natural order are more likely to occur to you in your daily work. For example, I wrote about how awareness of the symmetry of the natural order has already aided scientific research, in the field of particle physics, in a previous article called Creativity in Science through Beauty. Those who want to learn about this can approach any priest or religious (ie monk or nun) and ask them what they do. Alternatively, the Way of Beauty summer retreats at Thomas More College of Liberal Arts teach us how to pray the Liturgy of the Hours and how you can realistically incorporated it into a busy working or family life. It also teaches us just how the heavenly order that permeates traditional Western culture and can again in the future. Those who are interested in more information about this should go here. For a longer essay on this read The Cosmic Liturgy and the Mind of the Creator. 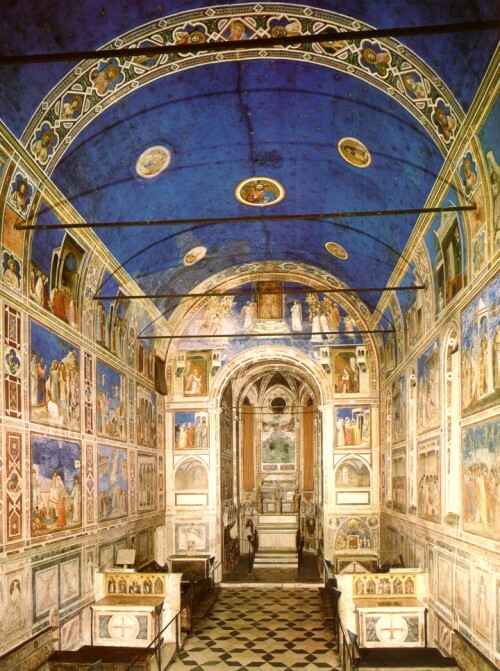 The painting at the top is Fra Angelico and the frescoes below are by Giotto. Note the stars in the sky. This is not just a device by an interior designer to make the space seem bigger by creating the illusion that there is no roof. This is deliberately encouraging in us the sense that the cosmos is praying with us and that the heavens point us to Heaven. 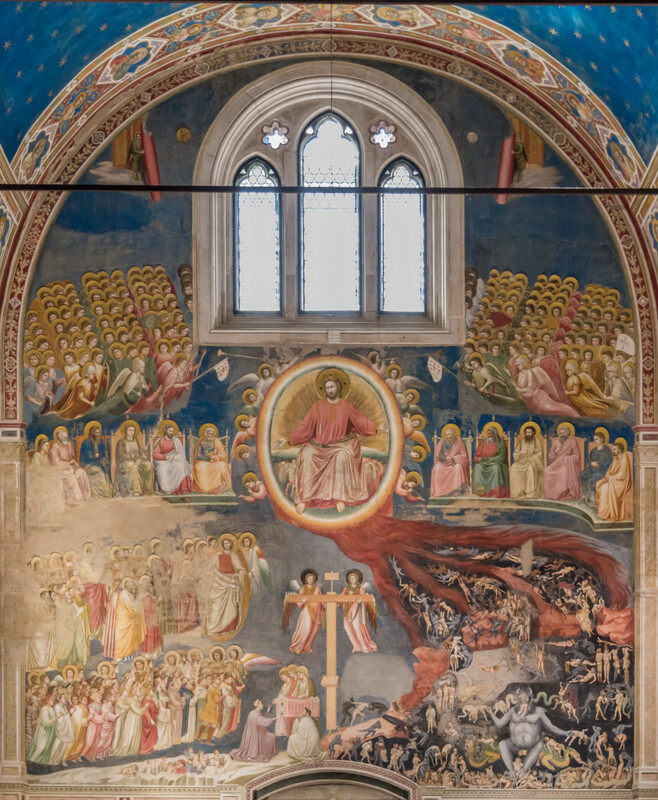 Below, Giotto's The Last Judgement.